Editor’s Note: Read more about Jörgen Johansson on the BPL Wiki. In my mind, a disproportionate number of my army days were spent dragging a pulk through heavy snow. On different sorts of missions that our instructors dreamed up "behind enemy lines," we waded through deep snow on skis, hauling pulks laden with grenade launchers, machine guns, explosives, and ammo… not to mention the twelve-man tents swollen with snow and ice. Then there were the stove and stovepipes that irregularly blessed us on cold nights under the aurora borealis of northern Sweden. After a couple of days and nights, even the packed tents were so choked with ice that they made the pulks nearly the size of minivans. All this was pulled by two men with huge packs and machine guns dangling on their chests, dressed in camouflage that had once been white, back when we had first started from the regiment. In spite of these Freudian overtones (bigger is better! ), there have been times since when some rational part of my brain has realized that there might be circumstances when it is in fact quite energy efficient to pull something behind you, rather than carrying it on your back. But so far, the only foray into pulks since those long past mid-winter nights has been pulling my kids when they were small, on shorter ski outings. Until this very winter that is, in the year of our Lord, 2009. There has been an idea brewing in my mind for quite a few years that could be described: It would be so nice to have a light pulk strapped onto my pack so that I more or less would be able instantly to switch back and forth between pack and pulk. This year, while preparing for a ski trip up north around the Arctic Circle, I finally went from mulling to doing. Using thin aluminum sheeting and surprisingly little effort, I actually fashioned something that could charitably be called a pulk. And since the main idea was strapping the whole thing to my pack, I christened it The Rulk, combining the words "rucksack" and "pulk." This is the story of how The Incredible Rulk was made and how it fared during a four-day winter trip. The pulk part of the Rulk was fashioned out of 1 mm aluminum sheeting, bought locally for the equivalent of $6.00 US. If you want to get technical, the grade of aluminum is called EN 1050A-H14/24 over here, but it’s just plain aluminum sheeting with no special features. The sheeting was 1000 x 400 millimetres, which is some 40 x 16 inches. I came to these measurements after hastily stuffing my Golite Jam2 with an old synthetic sleeping bag (to make it really full), then measuring the length and width of this package. To strap the Rulk tightly to my pack, I used four plastic clips, the kind you can buy in boating stores. In fact, my local boating store had recently moved and couldn’t find more than two, so I had to snoop around and finally found the rest in a store specializing in flags. The clips are normally used to attach the flags to lines and poles and are basically a sturdy, plastic carabiner. I wanted them sturdy so that hooking them through holes in the aluminum wouldn’t wear them out, and I wanted them plastic so that they would be quiet against the aluminum and also not wear it out. To pull the Rulk, I used a few yards of 4 mm parachute-type cord that I happened to have laying around. Two ends were fastened (with two more of the clips described above) through holes drilled in the aluminum. I fashioned a belt made out of webbing and a buckle salvaged from an old pack, and I used some thin plastic hose to line and protect the cord where it passed through the aluminum. The waistbelt was simple and worked well. The cord looped around to the other hip and was about 5 feet long. On it was a plastic clip that hooked on to a similar length of cord fastened to the Rulk. Aluminum sheeting, 1 mm, cut to the size of the (full) pack, or 1000 x 400 mm (40 x 16 in). I have made my own camping gear before: packs, tents and clothing. But I’m really no great shakes at doing stuff with metal. However, after emigrating to Canada in my late teens, I worked at a ranch in Alberta where I saw that the most amazing things could be fashioned out of pieces of scrap metal. Also, I’m one of those guys who doesn’t care what it looks like as long as it works. As a result, I wasn’t afraid of giving the construction a try… so no one else should be either, even if you don’t have a misspent youth in Alberta to fall back upon. If I can make a Rulk, anyone can. I simply grabbed the aluminum and a piece of plastic PVC pipe. The diameter of the pipe was approximately 6 inches, which seemed the right size. I was only after something that could be used as a mold to give the front end of the Rulk an upward curve for ease in pulling over the snow. Using this drain pipe and a piece of wood as a cudgel, I shaped what was to be the front end in a nice curve upwards, taking less than ten minutes, since the grade of aluminum was quite soft and malleable. After this, I measured the Rulk against the pack and decided that it was a bit long for my Jam2. Lacking a pair of tin snips, I used a hacksaw to cut about 4 to 5 inches off the back end (I would later discover that this would turn out to be a bit too much). I used a file to smooth the hack-sawed portion, as well as to round the corners of the whole contraption to avoid accidentally slashing anything important to me somewhere far from the emergency ward. Starting out. The pack extends some inches aft (on the left) of the Rulk, and the cellpad is cinched in place using sternum strap and hip belt. This done, I measured about 4 inches in from each of the long sides and drew a line up to where the upward curve in the front began. I was a bit hesitant about how this would work and how the shapes would fit together, but it came out surprisingly well. I just bent the long sides along the lines, using the edge of a table and my knee to hold it in place while following the pen-marked lines. The metal was bent at approximately a 30-45 degree angle. Voila! I now had a sort of trough, curved at one end, with slanted sides, but completely open and un-troughlike at the other end. Time to bring out the power drill and a half-inch bit. I drilled eight holes along the sides of the almost-trough. These holes came out with jagged edges in the thin sheeting and had to be filed to a semblance of roundness and smoothness. One pair of holes was at the corners of the curved front part of the pulk. However, I did not want to pull the Rulk by these holes, because it would undoubtedly straighten the curve and generally disfigure the whole artistic installation. So I added another couple of holes at the front end of the bent, long sides of the trough, which were where the line to my waist was actually fastened using one of the plastic carabiners. The line went from there, with an approximately 4-inch liner of plastic hose to protect it as it ran through the forward hole on top of the curve. The line then was looped back, using about five feet of cordage, through the opposite hole (which was lined with plastic hose), and attached with another clip to the Rulk. This left a loop of cord that would be attached to a similar length of loop from the waist belt, using another plastic clip. The cord pulling the Rulk is fastened by the plastic clip/carabiner to the aluminum. A 4-inch length of plastic hose ensures that the cord is protected from abrasion while running through the hole in the upward curving front end. That leaves the remaining four holes in the Rulk unaccounted for. These were spaced, two on each of the long sides of the Rulk, in such a way that they would be lined up with the fasteners for the compression straps of the Jam2. I simply tied a plastic carabiner to the end of some cordage, hooked the clip to the hole in the Rulk and looped the cord through the webbing loop attaching the buckle of the compression strap to the pack fabric. The cord was then attached to itself using a friction/prusik knot which enabled me to hook on to the Rulk and cinch the whole thing really tight to the back of the pack, using the friction knots. This way, the Rulk can be cinched tight even if the pack varies in size and bulk. Friction knots and plastic clips attach the Rulk firmly to the pack, which are easily adapted as the pack shrinks or grows. I can honestly say that it took longer to purchase the material than to put it together. Doing what I’ve described will not take more than an hour, even if you’re an all thumbs person like yours truly. The last thing I did before packing it all up and getting on the northbound train was to put the whole rigmarole on the scales: 885 grams or just short of 2 lbs. Not bad. The big question now was, like with wheels on a cart, would the Rulk make moving the load so much easier that it would be worth this extra weight? Since the proof is in the pudding, I moved rapidly to the next phase in the development of the Incredible Rulk: the ski trip. Actually, this particular trip was something that had been in the back of my mind for a long time. Some thirty years ago, me and a pal went on a winter trip with ultra heavy loads in deep snow. After about half a day of this, we decided to take advantage of a nearby railway, known as the Inland Rail, to enable us to move in more comfort. Or to be exact, to enable us to move at all. The Inland Railway is a narrow gauge railway worming its way along the wooded spine of Sweden for some 800 miles. In fact, it was once built as an alternate way of connecting the north of Sweden with the middle portion. The main railway connection between the more populous south and the northern woods and mountains is along the coast of the Baltic, while the Inland Rail has always been a struggling alternative, built about a hundred years ago for defense purposes, among other things. In the time of my initial experience, thirty years ago, there was a daily train in each direction, making it fairly easy for my buddy and I to use the excellent skiing between the rails, stepping to the side twice a day to wave at the littel diesel powered train chugging past. Today the Inland Rail runs only in the summer, bringing tourists to areas far away from the throbbing city life. Quite a ride, and one that can be recommended. 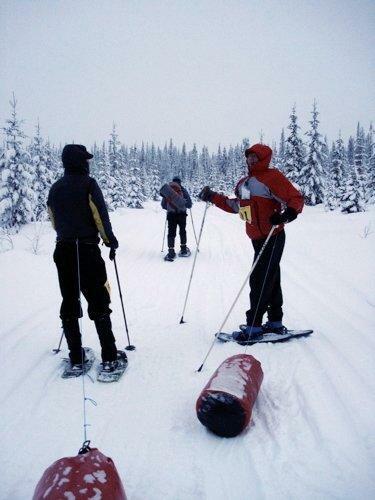 My own thirty-year-old idea of skiing the whole length had been whittled down by facts of life like work, family, and inclination, to the point where skiing between the two most northerly stations of Jokkmokk and Gällivare sounded ideal. In the end, I chose to start a bit outside Jokkmokk, because I wanted to be as far out in the Arctic taiga as possible. I also found out that, in spite of the railway normally not being used in winter, it had in fact been plowed for a train running a month before my trip, in conjunction with the Jokkmokk winter market in late February. Side Note: The Jokkmokk winter market has a history that runs back to the early 1600s, and you can still walk between different Sami tepees and buy furs and cured or uncured reindeer meat in many different recipes. However, some visitors to the market seem to prefer an entirely vegetarian diet consisting mainly of distilled beverages. Nothing much has changed for hundreds of years, except for the arrival of snowmobiles. To sum up, all this indicated that skiing with a Rulk could probably be a very comfortable way of travelling the 70-mile stretch in the four days/three nights that I had planned. All this boiled down to reality on March 18, 2009, when a taciturn taxi driver left me where the road crossed the railroad tracks about twenty minutes north of Jokkmokk. If my previous experiences with the collision of bright and shiny backpacking ideas with dull reality were any indication, the first ten minutes would probably tell me if the Rulk was feasible or a complete flop. One of my personal favorite flops along this line was when I tried to make skins for my skis out of an old cotton bedspread. It only took two minutes to prove that the bedspread stretched about 10%, then flopped uselessly on each side of the skis. This, of course, would be quite different. Well, at least hope springs eternal. To start with, my filled-to-bursting GoLite Jam2 pack was a bit longer than the sleeping bag stuffed model from my garage endeavors. Three to four inches of pack were sticking out behind the aluminum Rulk. I hoped this would be all right. The pack curved away from the snow and would not really be dragging, and I imagined that in twenty-four hours, the food I would consume would have shortened the pack sufficiently for the fabric not to wear too badly. Second, the heavy cell pad normally strapped to back of my pack had already diminished the perfection of design I had envisioned. The pad had to be strapped to the top/outside of the Rulk while I wearing it as a pack. This was easily fixed using the five-foot length of cord used to pull it while in Rulk mode. I just wrapped it around the pad and tied a simple knot. When switching to Rulk mode, I untied the cord and used the sternum strap and hip belt of the pack to attach the pad to the top of the load. Alas, this was a slight imperfection compared to being able to switch from pack to Rulk in seconds, but no big deal. Instead, it took about one minute to make the switch. To shift to a carrying position, the cell pad would have to be moved to the upper back of the aluminum sheeting and fastened with the dangling cord. Without going into details, I can say that the pack contained what I thought would bring me safely and comfortably through some seventy miles of forest just north of the Arctic Circle (which more or less passes through Jokkmokk, where I had picked up my taxi). This was also meant to be a test of mid-winter lightweight gear for arctic Scandinavia. Unfortunately, what could be termed mid-winter up here normally ends around March 1, so I was a couple of weeks late, due to my work situation. In March, the days grow longer, and the sun makes the days less frigid. However, the nights are often pretty cold, often dipping down to -20 to -30 C (0 to -20 F). A cold night coming down on the Inland Rail. The pack base weight was some 9.5 kg (21 lbs), with 3 kg (6.5 lbs) of food and fuel added. The clothing was sturdy: Paramo pants and anorak for deep winter, deep snow, and wood chopping for fires. For mountain trips without fires in non-mid-winter conditions, I’ve used thinner shell clothing with good results. Did the Incredible Rulk Rise to the Occasion? In brief, yes. It survived the initial ten-minute litmus test with flying colors. The sun was shining, and the temperature was just a couple of degrees below freezing, which, in combination with the hard surface between the rails, made for perfect skiing. In fact, it turned out to be so easy to pull the Rulk that I did not use it as a pack at all for the whole trip. So, if that was all it took, it could be called a rip-roaring success. The Rulk on the trail among the scraggly spruce of the Swedish taiga. But of course, this only meant that the basic idea was feasible, or at least better than the bedspread skins. Of course, attaining perfection on my first prototype isn’t realistic. The biggest overall problem, and something that needs to be addressed for the Rulk to be used outside of railways, is that it did not track well. With the cord as the only attachment, there is no stability transferred from the person pulling to the Rulk itself. It kept sliding all over the place behind me, following gravity and the law of least resistance. This usually meant that it followed one of the two grooves right alongside the steel rails. These made for slightly higher friction than on pure snow, and therefore more work for me. It also turned out that, over time, the friction from this groove changed the original, up-curved front and sled-like shape into something more similar to a half pipe. The Rulk became deformed, from sled to half pipe, running in the rut beside the steel rail. It scooped some snow, but the snow was dry and the original shape was easy to restore by bending the aluminum when necessary. An effect of this deformation was that the Rulk scooped up a bit of snow in front, snow that then traveled along the pack and fell off the rear end. This wasn’t much of a problem for this particular trip, since the snow was dry and didn’t wet the pack. The half pipe also made for lower friction, simply because it was adapted to the groove. This adaption, much like my original bending, was made possible by the relative softness of this particular grade of aluminum. The deformation was no big deal, since it was very easy to press the aluminum into other configurations when circumstances changed and a more sled-like front was preferred. However, the poor tracking combined with a relatively high center of gravity also made the rig a bit unstable. It tipped over on its side quite a few times, like when I tried to change directions and pull it out of the rut. In fact, part of one day the wind was pretty strong and also running at right angles across the track. During this period, the Rulk actually blew over onto its side a couple of times when I passed some marshy areas where the trees were scarce and gave little lee. However, this was not a big problem, since the whole Rulk was so light that it was easy to put it on its right keel and continue the trek. However, in a hard wind on the tundra, it would have been a lot more troublesome… which is where the beauty of the Rulk comes into play. When it’s not working very well as a pulk, you just hoist it onto your back, and if you are a lightweight backpacker, this is no big deal. The high center and instability were also a disadvantage in the deep snow beside the tracks, particularly on one night when I had to go a couple of hundred yards away from the railway to make camp. I sank to my knees, even with skis, and progress was not so speedy. The Rulk did not track well in my ski tracks, but instead tended to end up on its side, being a real pain. During these circumstances, the simple cords would probably best be replaced by the traditional poles used for pulks, which are bolted to the pulk and fastened at the hip belt. The Incredible Rulk turned out to work very well for the trip I undertook. I believe it is a piece of gear that most definitely could be developed further and might prove to be a valuable addition to the gear list for ski and snowshoe trips. It might even be worth its weight for thru-hikers on snowy passages, if dragging the pack would make post holing less exerting. However, the basic idea is there and tested on one admittedly special occasion, and anyone who wants to improve on my Rulk is welcome to it. In fact, if it could turn out to be a collaboration project, an open source hardware version of Linux, no one would be more pleased than me. Not to be forgotten: the Rulk is the perfect perch for the hourly intake of water (kept in pockets to keep from freezing) and snacks. I want to see something like this brought to market. I've done a few traverses in the PNW where the beginning and end are on dozens of kilometres of logging roads, while the rest of the trip is on glaciers or icefields. Half the time I want just a pack, but the other half a pulk would be better. If the pack was built with the "rulk" in mind, there would be a couple of benefits – by having one side of the pack replaced by the aluminum of the rulk you would eliminate the possibility of snow running along that side, resulting in less drag and wetness. Rather than using flexible tent poles to pull the rulk, what about a couple of rigid poles, that can then be used to support a pyramid shelter? A "keel" could help with tracking, and a foldable outrigger could help with stability. Jorgen, did you ever meet a young man named David Persson? Your stories of service in the Swedish military reminded me of him. I think the Norwegian outdoor brand Norrøna have been working on the same idea. So if they are or have you beat them! Use a plastic Paris pulk and cut away the plastic you don't need. I think the plasic will handle deformation better than aluminium ( ok 7075 series AL will probably do the trick, and cost a fortune…. ), glide well over snow. I found it refreshing to have a Version 1.0 MYOG article. Sometimes, just getting SOMEthing started is the hardest part. I wonder how loud aluminum is to drag on snow/ice versus the paris plastic. I found the plastic irritatingly loud. Bill Fornshell probably has the coolest pulk/pack combo. I did the same with my paris sled on the way out of a trip (carried on back) because I got sick of the noise. Nicely done! yet another project to add to the list. Yeah, I think that what kinds of poles to use and how to make them serve multiple purposes is an interesting field with quite a few possible permutations. Some sort of keel or rudder would probably be feasible. Takes some thought: Not to heavy and not too 'murphoid'. And no, I do not remember any David Persson. But at the time all Swedish guys went through the Army after high school, so the odds are slim. Cutting away the rear end of an existing pulk is pretty clever. If you could replace the existing poles or use them for a tent you might have something. I don't know how much it would weigh though. I'd like to stay really close to a 1000 grams with a Rulk. About noise: You would think that aluminium had the potential to be really loud, but I wasn't bothered. Cinching the pack tightly against the metal took away most of the tinny-ness. If you want a bit more info on the trip itself you'll find it at http://www.fjaderlatt.se/2009/04/along-northern-rails-with-incredible.html. It's in English also, although the site so far isn't, but will be to a higher degree. With the ease of this project I forsee v2 and v3 from other readers being a distinct possibility (myself included). A simple set of fins along the rear for tracking and a couple pieces of wire attached from the curved front to the sides to maintain the shape would be easy additions. Great piece Jorgen. For those trips where a pack is best some of the time and a pulk some of the time this is an excellent item. I might have to try and make one! If it is of any help, dog mushers have access to special plastic strips which can be bolted onto sled bottoms as low-friction runners. I really like the simplicity of your design and particularly the harness! That's very light but efficient. It would be nice to be able to have some shock-corded sectional aluminum poles to haul the Rulk with instead of just rope. Crossing the poles is the best way, I've found. IT gives more control on turns and permits shorter turns. With ropes only turns become a hand-on-the-ropes job. My plastic JetSled is almost too big for putting on even the large Dana Terraplane pack I use in winter but I may try it next winter. My ski patrol has an Avalanche II course with an overnighter. I may have to carry the pulk in some steep sections so I better try it out first. Wow, lots of ideas coming up here. I can add some from the Swedish forum. One is using a fullsized plastic pulk and cutting the rear end of where the pack ends. Another is using childrens skis and some crossbars to build a ski sled. I had ideas about skipping the aluminum and just dragging a Kevlar bag behind me on the snow. Maybe a combo of this and the kid skis? Ortlieb x-plorer L works very well if you turn it inside out. It is pack an a pulk. Blimey! Talk about lateral thinking! MOST interesting! Very interesting. How does it wear on different types of snow? Turning inside out means that you have to repack? So switching from pack to pulk takes a while? I use this drybag style only one day. It was ortlieb drybag PD 350 and jam2 inside. PD 350 is weakest material what ortlieb have. I get small hole in it but i repair it with spinnakertape. My friend use X-plorer L for couple times. PD 620 is strongest material what ortlieb have. No problem. No holes. We understand your comments. Your English is just fine. For this years winter outing I took something that is already on the market, The Paris Pulk, and sawed it off to fit my pack. It worked very well. For more details you can check the link below. Also, I'm interested in hearing if anyone has done anything similar, or made an improved version of the Rulk. In 2007, I bought the Paris Glad-A-Boggan Sled (4 foot version) and carried it attached to my backpack. I hiked in with it as a pulk, but didn't like the noise it made on the snow, so on the way out I carried it on my back (as I had wanted to be able to do if needed). Why no picture of you carrying the pulk as a rulk? That picture would seem necessary in an article of this type. You might have gotten the wrong article, there are several on the trip, all titled "Across Sarek in winter- something". In the article on the following link there is a picture of me carrying the rulk.